According to a new market report published by Transparency Market Research titled “Data Protection as a Service (DPaaS) Market – Global Industry Analysis, Size, Share, Growth, Trends, and Forecast, 2018–2026,”the global Data Protection as a Service (DPaaS) market is expected to reach US$ 74,174.9 Mn by 2026, expanding at a CAGR of 30.7% from 2018 to 2026. North America held a prominent share of the Data Protection as a Service (DPaaS) market in 2017 and is projected to be at the forefront of global demand. Also, the Asia Pacific Data Protection as a Service (DPaaS) market is expected to expand at a significant CAGR. By service, the DPaaS market is segmented into Disaster Recovery as a Service (DRaaS), Backup as a Service (BaaS), and Storage as a Service (STaaS). DRaaS is expected to be the fastest growing segment during the forecast period. Growing demand for data security and privacy across all data centers worldwide is playing a key role in driving the segment’s growth. On the basis of deployment models, the global DPaaS market is segmented into public cloud, private cloud, and hybrid cloud. In 2016, the hybrid cloud segment led the market accounting for approximately 50% of the total market revenue due to the growing number of large enterprises across the world looking for greater level of security and privacy on the cloud in order to cope with changing computing needs and costs associated with it. The segment is emerging as the best option for organizations that are looking to grab the benefits of public and private cloud deployment models at the same time. Also, hybrid cloud segment is projected to expand the fastest during the forecast period because of the growing complexities in cloud applications. By enterprise size, large enterprises led the global DPaaS market. Its growth is mainly attributed to the growing adoption of the hybrid cloud computing model, which is expected to be the future cloud computing model, mostly embraced by large enterprises. The small and medium enterprises (SMEs) segment is expected to rise the fastest during the forecast period. By industry, the DPaaS market is segmented into BFSI, Telecom & IT, government & public sector, healthcare, retail, energy & utilities, manufacturing, and others (aerospace & defense, travel & hospitality). 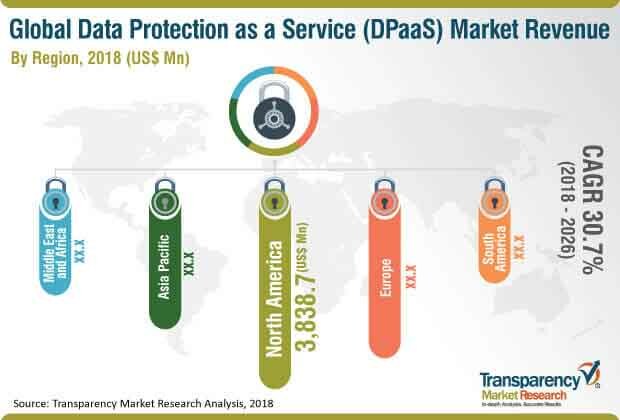 Based on geography, the global Data Protection as a Service (DPaaS)market has been divided into North America, South America, Europe, Asia Pacific, and Middle East & Africa. North America is expected to hold a prominent share and account for more than 40%of the global market in 2026, followed by Europe. The U.S. Data Protection as a Service (DPaaS) market accounted for the largest share compared to the Canada market due to greater spending on IT security solutions in the region. In Europe, the rising cloud spending by governments of countries such as the U.K., Germany, and France is observed as one of the major reasons for massive cloud adoption in both the public and private sectors of Europe. As a part of the strategy, several vendors are investing in tools development specific to a particular application and are focused on new product developments, partnerships, and mergers and acquisitions in order to increase geographical reach in the global Data Protection as a Service (DPaaS)market. Major players operating in the global data protection as a service (DPaaS) market include Amazon Web Services, Inc., Dell EMC, Commvault Systems, Inc., Quantum Corporation, Asigra, Inc., Veritas Technologies, Acronis International GmbH, International Business Machines Corporation, Hewlett Packard Enterprise Company, and Carbonite, Inc. The report on the global Data Protection as a Service (DPaaS) market provides analysis for the period between 2016 and 2026, wherein 2017 is the base year, and 2018 to 2026 is the forecast period. Data for 2016 has been included to provide historical information. The study provides a comprehensive analysis of the expansion of the market during the forecast period, in terms of revenue estimates (in US$ Mn), across different geographies. The report covers market dynamics including drivers, restraints, opportunities, and trends expected to influence the expansion of the global Data Protection as a Service (DPaaS) market during the said period. Technologies that are playing a major role in driving the market have also been considered in the study. The report also coverskey industry developments, and Porter’s Five Force analysis which identifies bargaining power of suppliers, bargaining power of buyers, threat from new entrants, threat from substitutes, and degree of competition in the Data Protection as a Service (DPaaS) market. Ecosystem analysis which identifies key stakeholders in the market is covered in the report. The Data Protection as a Service (DPaaS) market can be segmented based on deployment model, services, enterprise size, industry,and region. The deployment model segment is classified into public cloud,private cloud, and hybrid cloud. The services segment includes Disaster Recovery as a Service (DRaaS), Backup as a Service (BaaS), and Storage as a Service (STaaS). The enterprise segment includes large enterprises and small and medium enterprises (SMEs). The Industry segment includes BFSI, Telecom & IT, government & public sector, healthcare, retail, energy & utilities, manufacturing, and others (aerospace & defense, travel & hospitality).Geographically, the report classifies the global Data Protection as a Service (DPaaS) market into North America, Europe, Asia Pacific (APAC), Middle East & Africa (MEA), and South America; the regions are analyzed in terms of revenue generation. Furthermore, region-wise prominent countries covered in the report include the U.S, Canada, U.K., Germany, France,Japan, China, India, GCC countries, South Africa, and Brazil. Furthermore, the report includes competition landscape which comprises market share analysis, market positioning of major players in the Data Protection as a Service (DPaaS) market based on their 2017 revenues, and profiles of major players. Competition matrix benchmarks leading players on the basis of their capabilities and potential to grow. Factors including market position, offerings, and R&D focus are attributed to a company’s capabilities. Factors including top line growth, market share, segment growth, infrastructure facilities, and future outlook are attributed to a company’s potential to grow. This section also identifies and includes various recent developments carried out by the leading players of theData Protection as a Service (DPaaS) market.